We’re all familiar with the phrase “soaking up the sun.” But how much do we know about the effects that taking in too much sun can have on our bodies? The UV rays from the sun tend to cause damage to the elastin in our skin, destroying the body’s collagen. Elastin helps our skin snap back into its normal position. The sun breaks down these fibers in the skin causing sagging, stretching, and bruising. Over time, skin loses its elasticity and wrinkles begin to form. Over exposure to the sun also causes dry skin, freckles, brown spots, and sun burn. The pursuit of a “nice tan” in a lot of ways overshadows the negative effects that tanning has on our skin. In order to protect itself from the sun’s harmful rays, skin tans in order to create more melanin as an extra line of defense. As we get older, the natural course of time and change begins to take effect on our skin and it becomes rougher and loses elasticity. It also gets thinner and more fragile — easier to bump and bruise. 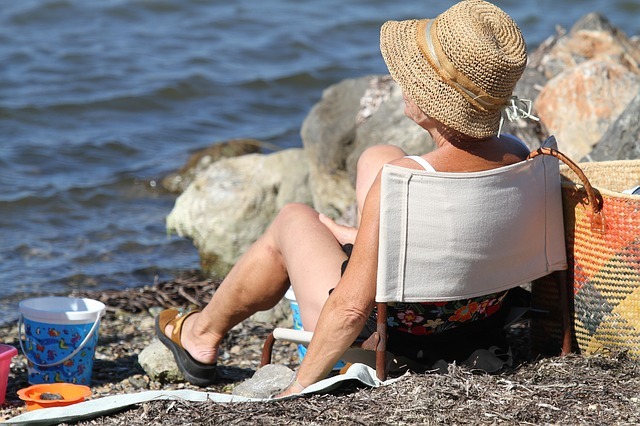 Long-term exposure to sunlight can also cause skin cancer, particularly in aging skin. Studies show that T cells in older adults are less likely to move to damaged areas in order to make the necessary repairs when needed. This leaves them more susceptible to cancer and infections. There are about one million new sun-related cancers that occur each year. And of those, one in every five people develop skin cancer. Try to avoid tanning. When skin darkens, it’s in response to the effects of the sun’s UV rays. Sunburns are just that. And after years and years of exposure to the sun, the older we get, the more our chances of getting skin cancer increases. Wearing sunscreen that blocks UVA and UVB rays at least 15 minutes before going outside provides major skin protection. Try to avoid venturing out between the hours of 10 am and 4 pm when the sun is at its hottest. If you are outdoors at peak times, limit your physical activity. Drink lots of fluids. Thirst means your body is dehydrated. As we age, our bodies don’t relay the message that its thirsty as well as it used to, so it’s good to drink about 6 to 8 glasses of water a day. Avoid wearing dark colors in the sun. They tend to attract more heat. Wear loose-fitting, light-weight clothing that keeps you cool, while protecting your skin from the heat. Large hats with a wide brim and sunglasses help protect aging eyes against cataracts and age-related macular degeneration. Learn to do routine skin self-exams to detect any new or unusual growths. Contact Freedom Home Care for more information about our services for the elderly as well as any additional information about skin care during the summer.